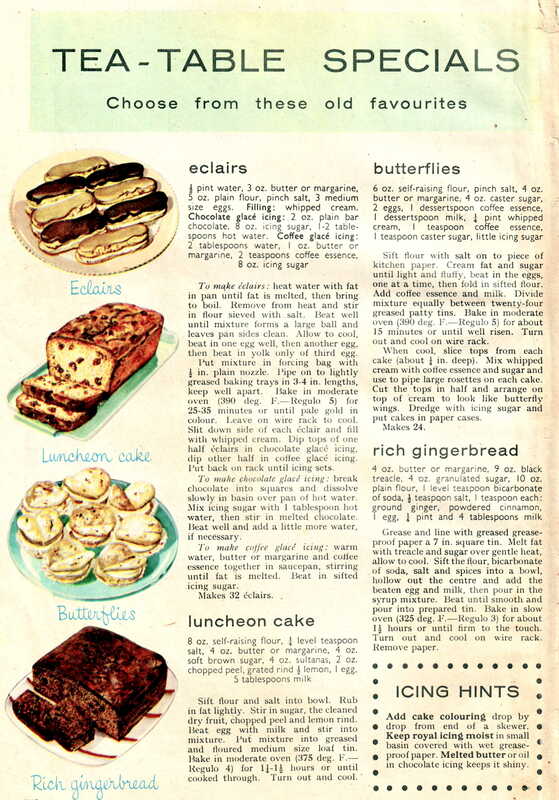 Some further recipes from the cookbook, this time showing a ‘Woman’ magazine supplement dated September 1959. 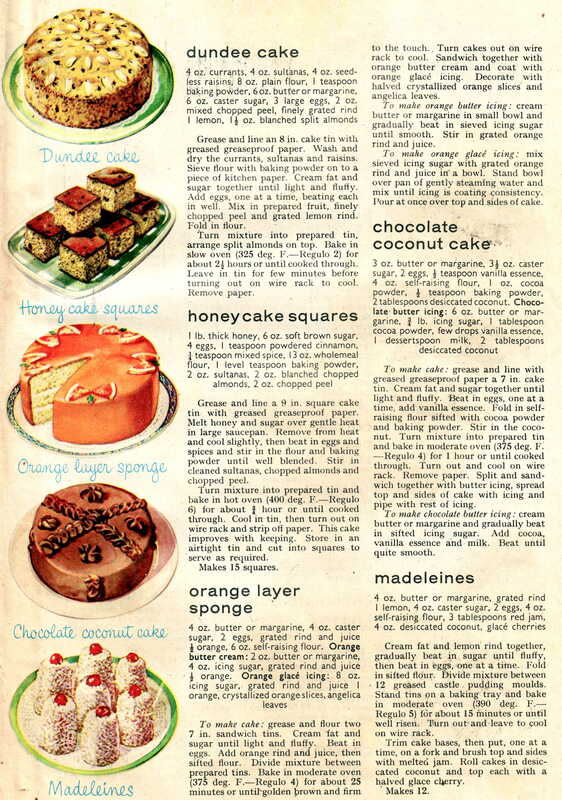 They cover the more diverse types of cake that would be produced ‘at home’. The cake tin, like the bread bin, was an integral part of the larder. Great store was held in having that, ‘something a bit special’ for unexpected visitors. 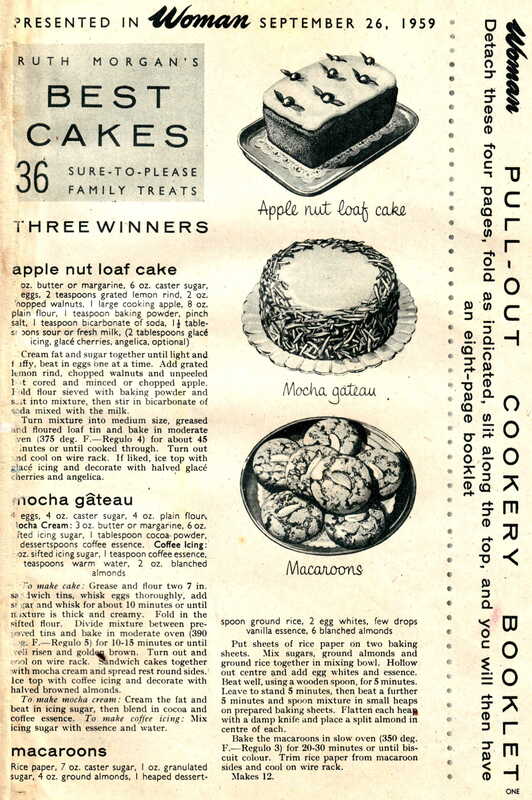 Or just to have a nice treat for the children on their return from school. Afternoon tea rose to popularity during the reign of Queen Victoria (1837 – 1901). It began with a revival of a far older Oriental custom. When the supply of tea from distant lands (India, China, Ceylon) increased in quantity due to the development of faster methods of transportation during the Industrial Revolution, tea (the beverage) came within reach of the middle classes. Afternoon tea became for a while a game of one-up-man-ship for the well heeled society ladies whose main concern was their social position. In more recent years Afternoon tea has fallen out of favour, since most adults now go out to work. The British working population however did not take it up. Due to the circumstances of having to earn a living, they would have a meal at around midday (lunch), and a meal after work, between five and seven o’clock. This meal was called either ‘high tea’ or just ‘tea’. Today, most people refer to the evening meal as dinner or supper, a hangover to earlier times when dinner would be served between eight and ten and supper would be a late night snack. High tea, on the other hand, was a far more substantial meal. Traditionally eaten in the early evening, it combined the delicious sweet foods, such as scones, cakes, buns or tea breads, with tempting savouries, such as cheese on toast, toasted crumpets, cold meats, preserves and jams or poached eggs on toast. 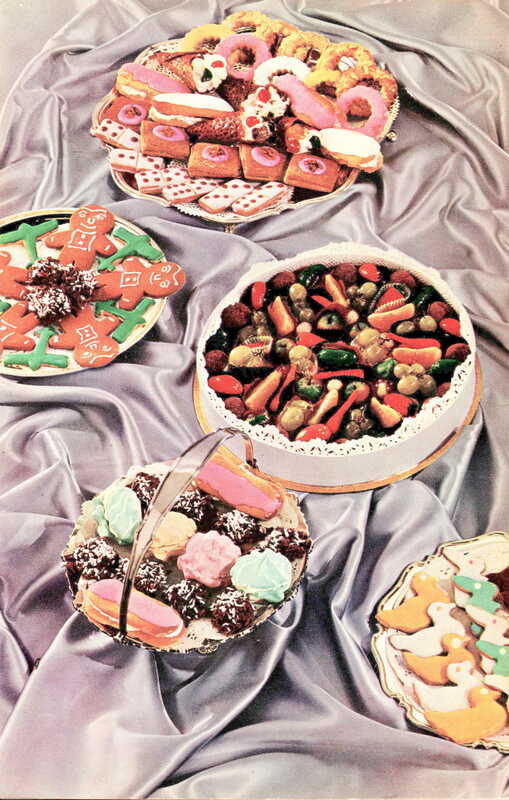 This entry was posted in Bakery, Cakes and tagged almonds, cocoa, fruit, larder, marzipan, sugar, traditional. Bookmark the permalink.